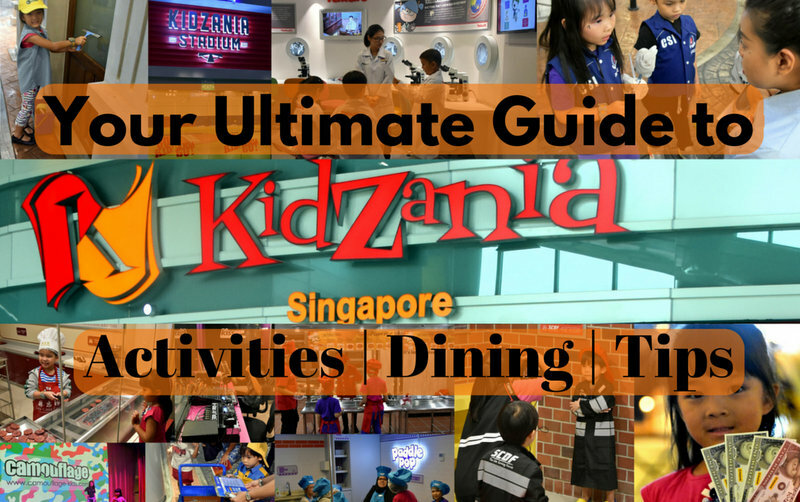 Your Ultimate Guide to KidZania Singapore - Activities for Kids, Dining Options & Tips to Maximise your Day! Finally, KidZania Singapore opens its doors TODAY! In case you are unfamiliar with the KidZania concept, just know that this is not your typical theme park. In fact, this indoor facility comes with NO rides or arcade attractions at all! Instead, kids get to participate in a variety of role-playing activities specifically designed to educate and inspire kids aged 4 to 17, creating a kid-centric city experience from arriving at the airport, to visiting a city centre and exploring the city streets. On top of it all, they get to earn a salary (in the form of kidZos, the official currency of KidZania), pay for goods and services and manage an ATM card - all the things they see adults do in real life! So yes, KidZania Singapore is THE place where kids ditch their parents and go looking for JOBS! And trust me when I say the kids can never get enough of the job-hopping. KidZania prides itself in offering the COMPLETE experience to its young visitors - starting right from the moment they step into KidZania Singapore. Upon arrival at the indoor city (Palawan Kidz City situated opposite Port of Lost Wonder), kids and parents will be issued with boarding passes at a counter designed to resemble an airport check-in counter. In addition, every child and adult will be tagged with a Radio Frequency Identification (RFID) security bracelet. Kids are only allowed to leave the park with an adult if his/her bracelet matches that of the adult who accompanied them. Kids aged 7 and below must be accompanied by a parent/guardian at all times while for kids aged 8 and above, an adult has to "check them in" and leave his personal details. At the point of entry, all kids will receive 20 kidZos and a bank card with a value of 30 kidZos for a starting total of 50 kidZos. The kidZos function like money within KidZania and can be used to participate in activities, save or spend to purchase items at the Department Store. The items in the Department Store start from 50 kidZos and the store is out of bounds to parents. After all, the aim is to let the kids take responsibility for their own spending decisions. In KidZania, kids are given the independence and freedom to manage their finances on their own, either at the bank branch or through the ATMs and iKiosks in the city. They are also able to open a personal savings account at any time during their visit so that they can deposit their hard-earned kidZos. iKIOSKs are located around KidZania for kids to check their bank balances. The kidZos earned need not be spent in that particular visit. The child is able to save and accumulate more on subsequent visits to KidZania Singapore. In fact, did you know that the kidZos earned in other KidZania worldwide can be deposited into the bank account here too? So if you have kidZos from other KidZanias, bring them down to the bank to exchange them. And yes, the currency exchange rate remains at 1:1. Internally, KidZania Singapore is spread over 2 levels and built to resemble a city. The streets are paved and there are establishments that one see in our everyday life - police station, fire station, hospital, bank, petrol station, restaurants. Personally, I feel KidZania Singapore is a tad more spacious than its Kuala Lumpur counterpart. I think it has to do with the wider streets and higher ceilings. And so, let's get to the most exciting part of KidZania for the kids - earning money, or kidZos! At every establishment, there will be a sign like the one in the above photo. The signs show information with regard to the job scope, as well as the recommended age group and duration of the activity. It also shows the payout of the job, and in the case of the Museum Curator, the payout is 8 kidZos. Not too bad a salary for 20 minutes of work I reckon. Each task takes between 20 and 40 minutes to complete. Not all establishments earn an income though. There are some which offer services, like making a burger, going on a high ropes obstacle course or studying for a degree, and these require a payment instead. While most of the activities are manageable for kids at least 4 years old, there are a few that require kids to be aged either 6 or 7 due to the nature of the jobs. Some panels also carry additional information on the left column. These may include certain conditions required for that specific job, like minimum height requirements, advance reading skills, or the need for insurance costs. There are some panels that depict a purple star too, which indicate that parents are welcomed to partake as spectators in that particular establishment. Or should the child have additional qualifications like a university degree, he or she gets to earn an extra 2 kidZos on top of the usual remuneration! But here's an important point to note: Parents are NOT allowed inside the job establishment areas at all times, unless otherwise stated. As for kids, look out for the 'QUEUE STARTS HERE' signage on the floor at each establishment to get started on the job hunt! As a rule of thumb, all of the Research & Development (R&D) nature type of jobs - Health Institute, Ice Cream Factory, Milk Innovation Lab, Science Laboratory and Water Quality Assurance Plant - together with the Aviation Academy are found on Level 2. Also, there are a total of THREE vehicles that kids can hop on - Fire Engine at the Fire Station, Ambulance at the Hospital's Accident & Emergency and Tour Bus at the Coach Station. At the Nickelodeon Acting Academy and Theatre, kids will get to role-play as their favourite Nickelodeon characters - it is currently Teenage Mutant Ninja Turtles but the characters get rotated as the weeks roll by. The aspiring thespians will be able to attend acting classes at the Acting Academy, wear character outfits and then perform for an audience at the Theatre. 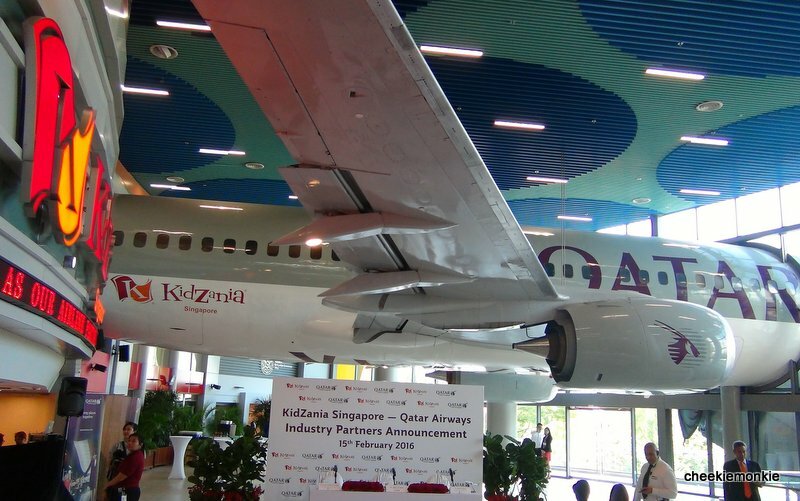 As KidZania Singapore's aviation partner, Qatar Airways will bring realistic aviation role-play‎ to kids. 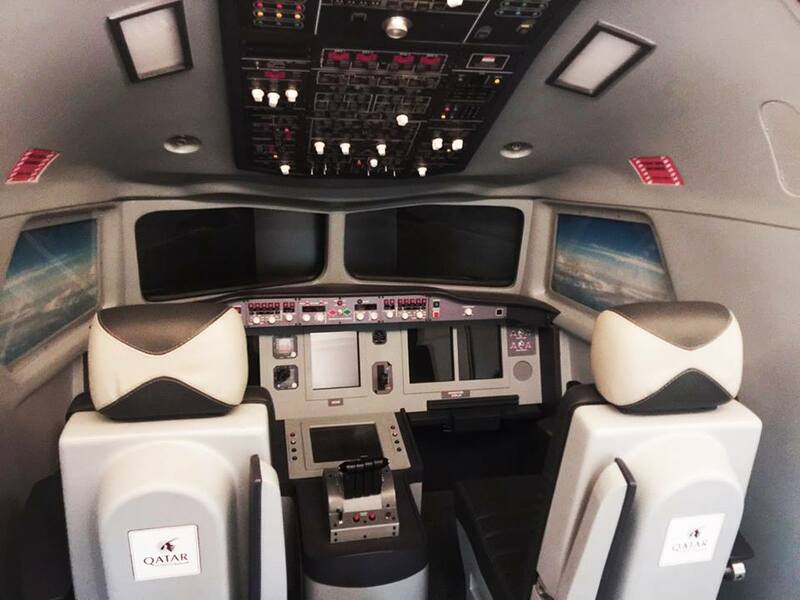 Aspiring pilots can experience flying two of Qatar Airways' flagship aircraft - the 787 Dreamliner and the A380 superjumbo aircraft - using the state-of-the-art simulators! The flight simulation facility is specially designed to demonstrate taking off and landing at Qatar Airways home base and hub, Hamad International Airport in Doha and Singapore Changi Airport. See the life-sized decommissioned Boeing 737 plane? That is where the kids will be having their training as pilots. Besides having the chance to captain the skies, the positions of cabin crew are open to kids too where they will learn how to ensure the safety and comfort of passengers on-board. For kids who are role-playing as cabin crew, parents will be able to join in the role play as a passenger where they can be served by their kids! Limited to 1 adult per 1 role-playing child. At the Bank, kids can assist fellow KidZanians with their enquiries and banking needs, and help them manage their kidZos with a bank account. At the Vault, take on the job of a Cash Officer and work as a team to prepare, deliver and protect the citizens’ money to ensure they reach their destinations safely! Kids will learn how candies of different colours and flavours are made, create their own candy and bring the hand-made candy home! Kids who visit the KFC Restaurant will play the role of a KFC Crew member, learn the importance of hygiene in the Food & Beverage Industry, and prepare their very own delicious, finger lickin’ good burger. And they get to consume it after that too! Get in the groove and wow the crowd by putting on an unforgettable dance routine during the hourly City Clock performance - and getting paid for it too! Also at the Nickelodeon Acting Academy, kids will be able to get loud and parade around the city together with other performers. Dance, sing, clap and make loads of noise: this is one job that truly pays for being loud! For kids who love climbing, they will be able to scale the heights of the tall climbing wall! Minimum height is 120cm, and a Personal Accident Plan from the Insurance Office is required. Kids can be a Tour Guide and show tourists all the sights in KidZania Singapore. Or hop on the Tour Bus and witness the monuments and landmarks in KidZania Singapore as a Tourist! Parents can hop on the bus and join in the fun as tourists too. Here, kids can role-play three roles in one place! Be a cashier and scan products or be a store assitant and ensure that the store is always well stocked to keep the customers happy! Kids can also role-play as customers and engage in some retail therapy! Kids will be able to take on the role of a Courier and deliver packages to designated establishments in KidZania City. Prompt and efficient service is the key! Kids can be a Crime Scene Investigator and keep their eyes peeled for clues and hints to solve a crime. They will be tasked to collect clues that have been spread across the KidZania city. Kids can perform an oral hygiene health check to prevent cavities and flash a bright smile as a dentist at the Sunstar Dental Clinic. Get the chance to film and host your very own documentary! Kids will learn how to edit their documentary by adding music or stock videos, and bring their finished work home too! Kids can apply for a driving license by passing a driving test. But they must have a valid eye test from the Optometrist before they can be issued a driving licence (validity period is for life). Minimum height is 130cm. Once they acquire that driving licence, they can put their newly acquired driving skills to use at the driving circuit, and get around the circuit in a safe and responsible manner. They will also be able to top up petrol at the Petrol Station. Minimum height is 130cm. At the Camouflage Fashion Boutique, kids can attend the Modelling Class and be a Trainee Model to learn how to catwalk. Mini fashionistas then become fashion gurus as they learn how to curate their own fashion style, and gain confidence by modelling their handpicked outfits in a fashion show. Parents are welcomed to be guests of the Fashion Show. A perennial favourite in all KidZanias around the world, kids will be able to don a Fire Fighter uniform, hop on to a Fire Engine and help put out the 'fire' at the hotel. Kids can be a Health Institute Researcher at Lifebuoy and learn the intricacies of soap making along with the importance of hand hygiene through the first-hand experience of making their very own soap. Kids will be able to hop onto an ambulance and respond to emergencies as a paramedic. Want something more challenging? Be a surgeon and perform a delicate operation in a fully furnished operating theatre, and learn important health practices. Or be a radiologist at the CT Scan Room, and analyse scan results while operating a functional CT scan machine, and learn the importance of early detection. For nurses wannabes, be a baby expert at the nursery and take care of newborn babies, learn the basics of diaper change, baby massage techniques and the benefits of baby moisturisers. Let kids be an ice cream maker and mix delicious flavours and ingredients at the Paddle Pop Ice Cream Factory. Kids will learn about nutritionally responsible snacking before enjoying yummy treats. Budding photographers can join the professional photographers at the Canon Imaging Academy and learn proper camera techniques, and pick up tips on how to compose beautiful pictures. Just like in real life, kids earn MORE kidZos when they 'sell' more insurance policies! They will be tasked to approach the citizens and protect their future by matching their needs to the available insurance policies. Also, this is the place to go to apply for insurance before the kids attempt the High Ropes Challenge Course at the Mountaineering School and scale the wall at the Climbing Wall. Unsure of what job to take on? Kids can take the Skills Set Analysis test here to find out which jobs are recommended for them. They get more kidZos when they complete the list of recommended jobs! And once they have gained some experience, they can head back here to prepare their resume. As a food scientist at the Abbott Milk Innovation Lab, children can learn about the science and processes behind how growing up milk is made and learn the importance of food safety and quality checks. KidZania Singapore is only the SECOND KidZania in the world (other than Mexico) to have its own High Ropes Challenge Course within its premises. Kids can be a brave mountaineer and take on the High Ropes Challenge Course. They will be able to test their courage, confidence and hone their psycho motor skills by manoeuvring through obstacle courses high above the city streets. Minimum height is 130cm, and a Personal Accident Plan from the Insurance Office is required. Aspiring journalists will be able to write about important events and news happening around the world! Or if they prefer, they can choose to deliver the newspapers fresh off the printer to the citizens of KidZania Singapore. Kids offer the gift of healthy sight as an Optometrist at Nanyang Optical, where they can conduct eye tests for customers and learn more about short-sightedness and astigmatism. They can also help customers to select the right lenses and frames once the eye test has been conducted. This is also the place to go if kids wish to obtain their driving licence as a valid eye test is required. KidZania Singapore is the ONLY KidZania in the world that has a Peranakan Museum! Kids will be able to learn about the work of a museum curator through taking care and displaying valuable artefacts from the unique Peranakan heritage. For some reason, kids love petrol stations! And this allows them to realisse the dream of being a petrol station manager at an Esso Petrol Station and help fill up vehicles for customers. Kids can learn more about the different types of fuels used to power vehicles on our roads, and the importance of good customer service. Young chefs will learn more about the ingredients and the dough, and watch it all come together at the Pizza Kitchen. They get to knead and shape pizza dough, add on their favourite toppings, before sending it to be baked at the Pizza Hut Restaurant. They will also be able to pack their pizzas into boxes to take home and enjoy with their family! Also a fave among kids, they will be able to assume the role of a police officer and ensure the safety of the citizens of KidZania Singapore by patrolling around the city with fellow officers in blue, and keep a lookout for any signs of danger. Kids can role-play as a radio presenter by running their own radio segment to play chart-topping songs, and co-host programmes with Kiss92 DJs Maddy, Jason & Arnold! As a bonus, they get to bring a copy of the recording home. Or kids can be introduced to the more technical aspect of radio programming as being a technical assistant and learn more about the high-tech equipment used in a live radio broadcast programme and how it is used to produce a radio program! Working as researchers at the Yakult Research Lab at KidZania Singapore, kids will be able to study and explore different experiments and learn about the benefits and essence of probiotics. As a probiotics scientist, they will be responsible for the differentiation between the good and bad bacteria, and to use the good bacteria to benefit the health of others. Kids will also get to role play as Assistant Soup Chefs at The Soup Spoon establishment. They will learn the steps and ingredients involved in whipping up a hot bowl of soulful soup, and discover its health benefits. KidZania Singapore will be home to one of the few stadiums available in KidZanias worldwide! The Kuala Lumpur and Jakarta ones do not have one. Parents will be able to cheer their kids on as spectators too. This is one occupation that is unique to KidZania Singapore! Kids get to be a Traditional BBQ Meat Specialist and discover the secret recipe that goes into the age-old process of making one of Singapore’s best loved traditional snacks at Lim Chee Guan Traditional BBQ Meat Store. And in case you are wondering, NO samples are given. The Learning Lab University will be the gateway for children to acquire distinguished academic credentials. There are 3 degrees on offer: Business & Finance, Communication Studies & Biochemical Engineering. Class timings for the various degrees are shown below. Kids must pay using kidZos to obtain a degree of their choice (Reading skills needed). And once armed with these qualifications, they can earn an extra 2 kidZos on top of the usual remuneration at selected establishments. Just like upgrading oneself in the real world! The Spritzer Bottling Plant offers kids to play the role of a Water Quality Assurance Specialist and learn safety and hygiene matters, testing the purity of the city’s drinking water and ensuring that it is free of bacteria and chemicals. Or they can choose to ensure the smooth delivery of the water all over KidZania city. Kids will be able to learn the proper way to clean windows - and perhaps help the parents at home after that. PHEW! That was a HUGE list of activities and truth be told. there is NO way that a child can finish job-hopping every single one in one, two or even three visits. 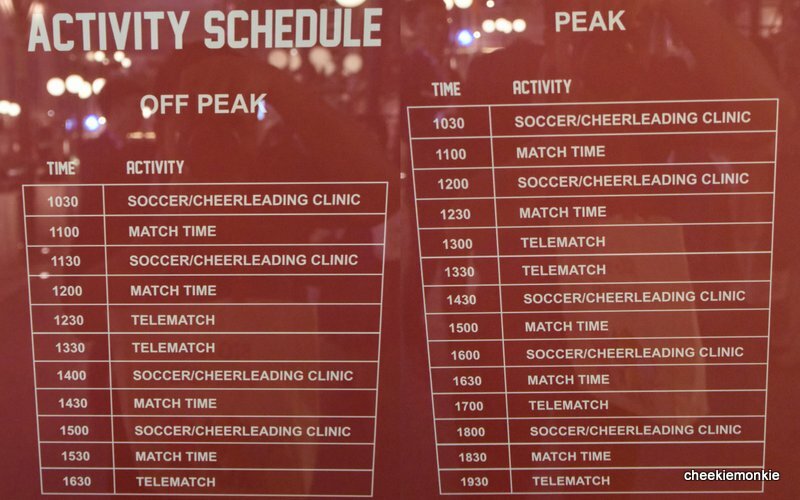 So while all of the job-related activities in KidZania Singapore have a minimum age requirement of 4 years old, where does that leave toddlers who are 3 years and below of age? If you have older kids aged 4 and above who are busying themselves with the activities - and you wish to bring younger kids to KidZania Singapore too, there are 2 exclusive sections on Level 2 that are catered to kids aged 4 and below. The first one is the RightZKeepers Residence, which is essentially one giant padded indoor playground made to resemble the interior of a house. There is a Living Room and Kitchen that are filled with toys, and jumping action waiting to be discovered in the Bedroom, where two inflatable beds beckon. But I think the most fun part of the house has got to be the toilet, where one can go have a dip in the soft balls bathtub! Situated right beside is the Kindergarten which is stocked with toys and art & craft materials to keep the little ones busy. Various programmes for toddlers will be conducted throughout the day as well. Nursing mummies would be glad to know that there is also a Baby Care Centre for private nursing and diaper-changing too. Compared to most KidZanias, KidZania Singapore probably has more than the usual number of activities that parents can partake in as spectators. These include watching their kids strut the runway or showcase their acting chops at the THEATRE, hop on the Tour Bus as a Tourist at the COACH STATION and let the kids role-play as Tour Guides and cheer kiddos on at the STADIUM. Parents need a moment away from the kids? Head to the PARENTS LOUNGE on Level 2! This adult-only retreat - yes, NO kids allowed! - provides parents with a place to get away to chill while their kids are slogging away. The resting corner is furnished with tables, chairs, couches, computer terminals and an F&B kiosk selling snacks and drinks. Let's face it, if parents are going to be stuck inside KidZania Singapore while the kids are off to earn some dough, then it really helps that the food and beverage options within the city are palatable enough. And judging from first impressions, there seem to be quite a variety of choices. The food-related industries within KidZania Singapore - Kentucky Fried Chicken (Level 1), Pizza Hut (Level 2) and The Soup Spoon (Level 1) - also retail actual meals to visitors. In addition, there are 2 further dining options. Traditional coffeehouse KILLINEY KOPITIAM serves up traditional freshly brewed coffee and kaya toast while visitors can enjoy authentic Indonesian cuisine in the WARUNG M NASIR cafeteria. Both are located on Level 1. In addition to the Department Store, there is a SHOPPING ALLEY which is home to a range of shops that the kids can blow their kidZos on. At the ART STUDIO, kids will be able to get all crafty and let their imagination run wild as they create their own greeting cards and bookmarks! Adults are welcome to join in as well. But I think a sure-fire hit with the girls will definitely be the MAKEUP ATELIER, where they can get all funky looking with colourful makeup! On your way out of KidZania Singapore, you will be able to purchase exclusive souvenirs from the KidZania SHOPS (with Singapore currency, not kidZos!). If you are planning to head back to KidZania again, the child could sign up to be a B-KidZanian and get his or her own PaZZport for a one-time fee of $18. The PaZZport is valid until 18 years old and privileges include earning or saving 2 extra kidZos on every activity the kids complete. The more kidZos earned or saved equate to more activities they can enjoy. When kids earn 30 stamps, they become Distinguished CitiZens and will earn or save 4 extra KidZos per activity. And when they earn 60 stamps, they'll become Honorable CitiZens of KidZania, earning and saving 6 extra KidZos per activity. In addition, they get preferential access in KidZania cities that offer the B-KidZanian Programme! Here're 10 tips to maximise your day out at KidZania Singapore! 1. To ensure a pleasant experience in the City, KidZania Singapore has a capacity limit so tickets are on a first come, first served basis. To guarantee entry, book your tickets online beforehand. You may purchase tickets up to two months in advance. 2. Online purchases are entitled to 5% discount off walk-in ticket prices. And if you pay using a Maybank Credit or Debit Card, there is a 10% discount instead. 3. KidZania Singapore is open for 7 hours from Sundays to Thursdays and 10 hours on Fridays, Saturdays, School holidays, eve of and Public Holidays. To maximise your time there, be prepared to stay for the entire day. Re-entry is NOT allowed. 4. Arrive earlier before the opening time of 10am, as there will be a queue waiting to enter. 5. Upon opening, most kids will head to the Bank to deposit their 20 kidZos and to activate the bank card... which translates to long queues at the bank (just like in real life). If the queue at the bank is long, skip it and head straight to the establishments to earn some kidZos first. 6. And avoid going to the bank when it is near closing time. The bank will be swarmed with kids who are either eager to deposit their day's earnings or withdraw their kidZos to spend. 7. Have an early or late lunch. Queues at popular occupations may be relatively shorter come meal times so be sure to take advantage of that. 8. Another trend seen at all theme parks is the crowd usually dwindles near to closing time. This will be a great moment for the kids to earn more kidZos! 9. Getting a degree at the University can help to earn more kidZos, depending on the course and the nature of the job. 10. Realistically, your child will be able to cover about 6 to 8 jobs as a fair amount of time will be spent on queuing. To up the number, parents can scout ahead to ascertain which occupations have a shorter queue. But do note that parents are NOT allowed to queue in place of their kids. 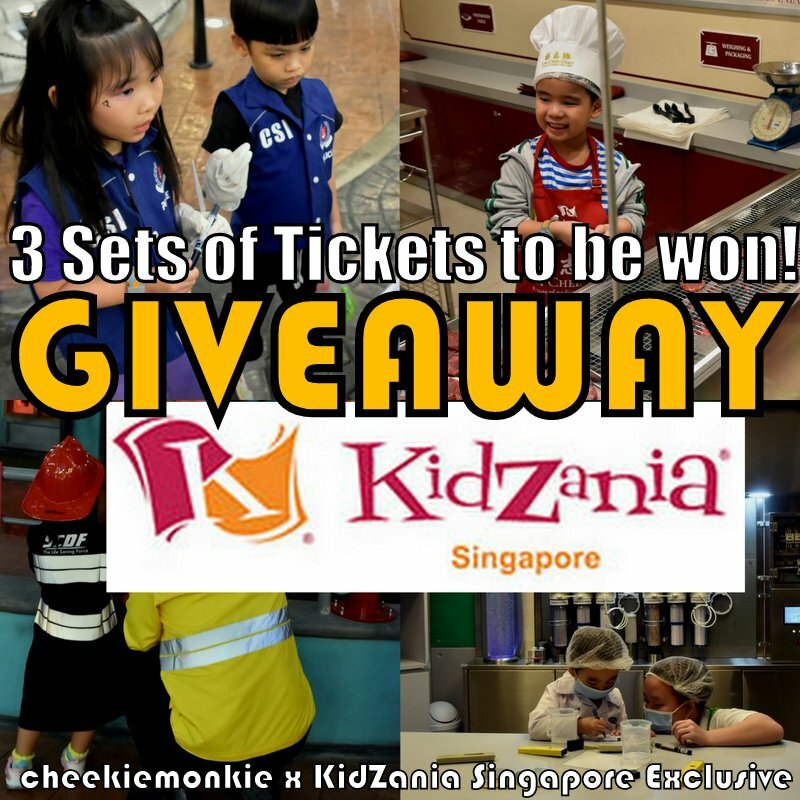 You have each won a SET of KidZania Singapore tickets! Each set consists of ONE Adult and ONE child tickets, worth $93 in total. Tickets are valid til 31 July 2016. Thanks to KidZania Singapore, I have THREE SETS of KidZania Singapore tickets to give away to 3 lucky families! Each set consists of ONE Adult and ONE child tickets, worth $93 in total. Tickets are valid til 31 July 2016. 1. LIKE KidZania Singapore's Facebook page HERE (if you haven't already done so). Giveaway ends on 29 April 2016, 2359 hours. I want the opportunity to visit Kidszania. My kids will love to visit Kidzania. Thanks for organizing this giveaway! Completed both steps! & Shared post too!! We have heard so much from friends about KidZania KL, and now they are finally here in SG!!!! Really hope to Surprise/fulfil my kids request to visit KidZania SG..
Hope to win the giveaway ticket for my boy's birthday gift as he will be turning 4 next week..
Cross my finger.. Hope to win.. Finished the 2 steps. Hope to win and bring my boy and nephews to KIDZANIA SINGAPORE. Thanks to CHEEKIEMONKIES for the Giveaway. Would appreciate if I win this as Ive just resigned from my first and only job as an early childhood educator of 6years due to moving to a new house as well as to be there for both my girls after not being able to do so at their early age. In addition, my husband just started his own business thus we are taking things one at a time, forgoing our wants but focusing on our needs. Winning this means time as a family for the four of us! God bless you! Liked. Hope to win for my boy's 6th year old birthday end of the month. Thanks. Done all 3 steps! Hope to win! My kids are huge fan of Kidszania! It would be a great splendid pleasure to be able to visit kidzania as we are really looking for ways to it. Liked :). Not been to kidzania before. Hope to bring my daughter there! It would be a great pleasure to be able to visit kidzania when we are back to our own country. Of course we would love to be able to have these wonderful gifts. Thank u. Would very much love to bring my kids to experience Kidzania! & earn some KidZos! Thank you for the giveaway. Hope to win tickets for my kids to experience this unique experience. Educational fun for them to work and earn through their efforts. They have been very excited eversince they know about Kidzania Singapore. Thank you!! Love to win these tickets for loads of KidZania fun..
Hope to win the tickets for my princesses who's so looking forward to go KidZania Singapoere. Hope we are the lucky family! Hi Kelvin, liked and shared! Just wanna say a big thank you for writg up on activities fr families. I enjoyed reading your blog and its a great blessing to families with kids! Very glad to see fathers like yourself taking time to spend quality time with ur children! Hope Your blog will inspire more dads to follow too. Look fwd to more posts fr you! Arigato! Jiayou!! We love Kidszania, and have been to the Bangkok one twice. Would love to have the free tickets to visit the Singapore one soon ! looking forward to it. I want to bring my son there! Wow...kidzania, i really love to try and visit this place for my daughter as i really want her to feel the life of being adult... in this kidszania she will surely learn a lot of thing specially realization of our real life, one best thing about this is when children will find it out that, if you want to have money for your enjoyment you have to work for it... �� It would be glad if i won the ticket... haven't win yet but thank you very much cheekiemonkies ��. My daughter, 8 yo, is excited and ready to explore KidZania Singapore. Pick us please. My kids would definitely be overjoyed..
My boys would love to visit kidzania! Hope that I can win for my boy for a "charging battery" trip as he will be taking his PSLE this year and a fun-filling trip for my girl too. Have liked the Kidszania page. Have never been to any Kidzania (be it Singapore or other country). I believed it would be a fun and valuable experience for my boy who is turning 6 in July. My little girl would love to experience all the different jobs and have loads of fun at Kidzania! Thank you for the giveaway! My kids love Kidzania. I hope to win the tickets! Hope my kids will have a chance to visit Kidzania! Crossed my fingers! I Hv been to bkk kidszania and was impressed with the activities. My girl who enjoyed most and wish to go for her own country kidszania this year! I hope I'll able to surprise her this pair of ticket and bring her for a good June break at Sg kidszania. Hope to allow my 4yrs old son to build up his independence through this hands on activity. It's a very educational and exposure for him to slowly get to know the different types of occupation and their duties at work. the next best thing to a disneyland! really love kidzania! It's been a long wait for both the kids and ourselves. At last, they can play in Singapore instead of going so far away. Hope to win the tickets to bring the kids to plat. Liked and shared. Hope to win. My 3 kids would love to visit KZ. I hope to win the 3 tickets so that my kids will have a chance to go. Liked and shared. Hope to save a set of the entrance fees and I only need to purchase for 2 more kids and 1 adults. I have 3 kids age 5-8yrs and it's a hefty amount for a family of 5 to go Kidzania! But the place look so interesting for my kids to have some fun and destress from heavy sch work! My gal can't wait to go! ☆〜（ゝ。∂）liked and shared. I hope I can win the tickets for my 2 kids. And good luck to everyone! Liked and completed both steps. Hope to win the tickets for my kids. My little one will b having sleepless nites if she wins. Good opportunity to expo her to diff trades and life as a working adult. Good bonding session for both parents and child. Thanks for organizing. I would love to win the tickets to Kidzania. My little girl will be estatic! Wish to win this fantastic giveaway... Thanks for the opportunity.. Perfect birthday gift for my boy that turns 5 in June!!! It would be great to bring my eldest kid to kidszania and spend some precious one on one time with him, especially after the recent arrival of my third child. Thanks for organizing the giveaway and for all the information on your website. I have managed to create wonderful memories at the places suggested by you on your blog. Thanks for the giveaway! Liked and shared. Liked & shared your post via fb.My kids have been asking me to bring them there & would love to have this opportunity to win the tickets. This month is my gal 7th birthday... It would be a really nice birthday present for her. My two girls have been anticipating it since it was announced last year. I hope to bring them. Thanks for the opportunity. And btw, I appreciate all your blogs about kids matter and recommendations. I have used some of them to prepare for parties and stuff. Regards. Hoping for an opportunity to win this fabulous activity for my child! It will be her next birthday gift ever ! Liked Kidzania Facebook. Wish to stand a chance to win this give away. I want the tickets . Hope to win the admission tickets. Would love to bring my 2 kids there b4 #3 comes out. They will enjoy the bonding time and surprise as they have been saying 'Mummy I want to go Kidzania!!' each time the advert it on! Liked. My kids would love to visit Zidzania. It's gonna be the best present for her as birthday present and bonding time with her daddy. I want to go kidzania with my son! Thank you for your effort in sharing the post and the tips on Kidzania. This will be a good experiential activity for the children. Children are brought up in this modern era with multiple digital gadgets and economy diversity, Kidzania really provides them hands on activities and increase their knowledge of the different occupation. I do hope that my children will understand the hardwork that goes in behind every single occupation and treasure people from different workforce. Hope that I can win the contest too :) (Have liked the page too). Heard so much about kidzania and I wanna bring my kids to experience it themselves. I would love to have those tickets to bring my son and nieces over during the school holidays. It'd be a great family fun bonding time together! Liked :) thanks for the chance to win the pass. I loved to bring my boys to Kidzania for a full load of experience and fun! Liked! My 5yo and 6yo will find this interesting! Am sure my older nieces and nephew will have fun too! Finally kidzania is here in Singapore! Would love to bring my child to Kidzania for her birthday surprise! Yeah!! I want to win!! Wanna bring my son and my 2 sweetie pie nieces there! I would love to win - KidZania @ SG. Heard about the one at KL & BKK but wait for SG and finally it's out! Thanks for giving out the tickets in advance. Liked & Shared. Hoping to bring my girls for their very first Kidzania experience! Thanks for posting. Very good information and tips. Great photos. Hope to win tickets so that my gal can get to experience this. Wonderful and detailed explanation of kidzania! Makes me can't wait to go q my girl! It will be a wonderful experience for the kids and a good learning journey. Hope to be able to bring along my 5yr old son to have a fantastic #zania experience. Hoping to win a wonderful experience for my gal how is turning 8 next month! Thanks for posting an informative entry. Having been to the Kidzania in BKK and KL...I would like to try the Singapore one too. I hope I can win the ticket for my girl:) Liked and Shared! Liked and shared! My kids and I really hope to win the giveaway tickets for KidZania. Thanks a million! Thank you for sharing so much fun! Liked it and shared it. Hope to win the tickets for kids to experience it and have fun in KidsZania. Hi friends, just to share with you this giveaway. Would love to win to bring my 2 kids to play! I love the idea of role playing. As a kid, I always wondered what it would be like to be in the operating theatre, a police officer and even a model. Having entered the workforce, there is no way I would ever be able to gain such experiences. Wished there was KidZania when I was young. I would like my 10 year old brother not to miss this fun-filled and eye opening experience. Not only will KidZania provide him with a better idea of what he would like to grow up to be, he will also be able to appreciate the services provided by different people of the workforce. It is a great way to learn to manage credits and understand the value of money too! Thank you for the opportunity to win tickets! I would love for my mother and brother to engage in a bonding session through KidZania. Liked and shared on FB. Great and detailed explanation on kidzania ..... Really wish to win the ticket to be able to bring my 8yr old and my 1yr old girls there. Thanks for the giveaway. I hope to win this for my 2 kids who have been bugging me to bring them ever since they knew of kidzania existence. Liked & Shared! Cross my fingers and hope to win. I wish to bring my boys to Kidzania, as they love to role play. They never been to any of the Kidzania before. I would also like to reward my elder boy who has special need, he has been trying his best in the school. Hope he can have wonderful learning experience through play in Kidzania. Liked and shared. Great chance for my son's imagination to run wild. All done and fingers crossed for this wonderful giveaway to KidZania Singapore. My boy will definitely love it. wow! thanks for the detailed write-up! really really my elder boy can win the ticket and baby brother can tag along for a amazing experience! Somehow on Kidzania SG website, there is no map or interactive map to plan out the possible itinerary. My boys would love this awesome place!! They can play many kinds of role play and learnt how the society working environment is~ hope I can have luck to win this giveaway! Hope to be lucky enough to win the tickets!! Wow! Awesome Thank you Cheekiemonkies for the wonderful giveaway! It will be a great & fun experience for my children. They will have a chance to earn their pocket money to their sweet treats! Liked & shared on Facebook too! Thanks to Kidzania Singapore for the give away tickets. Just nice one adult & one child tickets so my husband can bring our only child there to experience and learn about different kinds of occupations and talk about what he wants to be next time furthermore enjoy father & son bonding time !! liked Cheekiemonkie FB page and Kidzania SG FB page! Hope to win for my 2 lovely children who wish to go but I cant afford. Thank you for the review and awesome photos! Been waiting for it. Yay! finally a kidzania whereby my kids can understand the instructors and have a better experience "working" in kidzania.! Awesome that they have something for the toddlers too! So excited to bring my two kids there! Thanks as always for providing another great giveaway!!! Gladly liked and shared with everyone! Liked and shared! Hope to win this for my boys! Thank u! Liked and Shared.. Thank you for hosting this funtabulous giveaway :) Really hope to win the tickets for my boys so they can go explore the many jobs and activities in KidZania! Thanks for the really useful tips! My kids love visiting kidzania and they are thrilled it is now in Singapore. I've liked and shared!. We hope to win more tickets! :-) perfect birthday treat for them. Thank you! I have a question -- do toddlers go in for free? Awesome! Can't believe that you are having a giveaway! Done all steps. Also commented over at FB link. Thanks so much. Hope to be the lucky one! Thank you for the detailed write-up of Kidzania. Hope to win this to bring my 8-year-old gal to explore different job scopes. It's great that Kidzania is in Singapore. Renown for being educational and an experience for the young ones, the different occupation-themed sections really give the children an opportunity to be exposed to different jobs at a young age. It's like an indoor playground, but much better on the fun factor. Can't wait to bring my 2 children to Kidzania ! Proud to have our very own Singapore version. Bigger and better! I have been to kids zania in kl and Bangkok, both my kids love it and we would love to visit the one in Singapore. Hope to win the tickets ！ so looking forward to! I like to win this as my kids will then know that one must sweat and toil to earn his keeps otherwise they will not know the true value of money. I haven't had the chance to visit any Kidzania and I hope my first maiden trip with my kids will be Kidzania Singapore on our home ground! Thank you for hosting the giveaway! Super eager to visit this latest attraction!!! The plane looks awesome from the outside and I just can't wait to bring the kids (husband included) to play at KIDZANIA! Liked the page. Please let us experience Kidzania...! Thank you! My girls dream come thru but still need to wait for the result in this giveaway for my girl to get the chance enjoy on this educational fun. Awesome giveaway for both the young and old! We went there twice and it was awesome!!! Obviously this is a paid for post from kidzania. You will never arrive at the Singapore kidzania without 1.5 hour Que to get in. Then the kids will be really bored waiting 45-1hour for each activity. Outside Singapore the organization is far better. I would like to think that this is your first time visiting my blog. Because if you are a regular reader, you will know that I declare all my posts upfront if they are paid posts or media invites. The declaration can be found in the first line of the post, directly under the blog post title. For this post, I was not paid. Rather, it was a media invite, i.e. I was invited by KidZania Singapore for a sneak preview before it was opened to public. The key idea was not to 'test' out the queuing times but to share more about the various jobs that kids will be able to undertake so that parents can make a more informed choice. I have since brought my kids back to KidZania in August and while we did not go on a weekend, the queue to enter and the queues for the job took us no more than 15 minutes on average each. Lastly, perhaps you may consider leaving behind your actual name instead of hiding behind a nameless identity to sound more credible. Thanks for your time nonetheless! It is true. Every decent 'job' require a at least 45min wait. My kids walked from job to job and spent almost whole day queuing. Parents equally frustrated. perhaps it is school holidays period therefore overly crowded. We'll come back on a normal weekday nxt yr.
hopefully it will be better.